The Green and Whites scored the only try of the game in a 15-13 loss against a side that have suffered two relegations down from the National Leagues in the past three seasons. 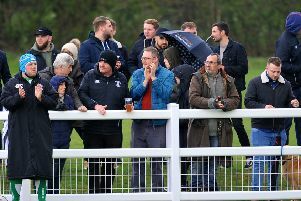 It proved a disappointing game, played in the rain, with multiple handling errors and in which both sides cancelled each other out, while Horsham incurred the wrath of the referee with some ‘odd’ interpretations. Gravesend built more attacking positions in the opposition half and took advantage of penalty opportunities without ever looking like crossing the line. Despite this, Horsham opened the scoring following a scrum penalty and a put-in from a strong platform saw Michael Tredgett pick up from the base to power over and score. Tom Johnson added the extras by drop-kicking his conversion from wide out and after seven minutes the score was 7-0. Good line speed from Horsham was putting pressure on the hosts, forcing errors and when, on 18 minutes Gravesend were penalised for pulling down in the line-out, Johnson made no mistake with his kick. This was as good as it got for Horsham as Gravesend slotted a series of penalties from scrum-half Rhys Betts as they pulled the score back to 10-6 at half-time. Liam Byrne-Stevens had another penalty attempt which bounced off the posts, but with the ball still in play Horsham were then immediately penalised after a disputed penalty for kicking the ball through - this time in front of the posts, Byrne-Stevens made no mistake. When Simon Powell was yellow carded for not releasing the ball, Byrne-Stevens slotted another penalty and for the first time Gravesend led 12-10. Declan Nwachukwu then ran around his man and the attack was carried on by Josh Steggles leading to the award of a penalty which Johnson put over for the Green and Whites to retake a 13-12 lead. This was short-lived when Byrne-Stevens made the decisive penalty kick with seven minutes remaining to win the game 15-13. Horsham head coach Nick Stocker said: “It was a frustrating day and result. Our defence was much better keeping them from scoring a try but we still managed to get on the wrong side of the ref and could not build phases to pressure with any significance. “The ref had some very influential decisions, particularly at the breakdown where his interpretations were odd resulting in penalties, despite having signalled to allow play to progress prior to penalising us. This led to confusion amongst the players and difficulty for continuity and ultimately the winning points against. Stocker praised 19 year olds debutants Powell and Josh Earle as well as Bobby McEvoy for his first outing in a Horsham shirt and added: “With an expected ten players back available for selection for next week, we will put this result behind us and focus on the things we can control and work hard preparing for a long road trip to Thanet where we intend to get the season back on track. Horsham: Wilde; Nwachukwu, J.Bell, T.Johnson, W.Johnson; Blewitt (Steggles), J.Fisher (Carvell); Fairs, I.Fisher, E.Powell (Earle); Osgood, McEvoy; Redmayne, S.Powell, Tredgett.